Haifa Amg does not want to be an asylum seeker. She wants to be a doctor, and was studying towards this in Glasgow. Then the Saudi Arabian authorities took action that made this impossible. Haifa is one of what must be a small number of women funded by the Saudi government to study abroad, and had a scholarship that paid her fees. Saudi regulations required her to have a male guardian, but in her case this was no problem, since she was accompanied here by her husband Amri, a teacher of mathematics, and their children. What neither of them realised was that Amri would be asked to act as a conduit for unofficial payments from the Saudi government towards a group who were converting a church into a Wahhabist (which by many definitions would make it extremist) mosque. This he was unwilling to do. The Saudi government imposed escalating pressures, culminating with freezing their Saudi Arabian bank account, and suspending Haifa’s scholarship. No scholarship, no bank account, no money to pay fees, no longer a student, loss of student visa. Haifa and family were left with two choices; to return to Saudi Arabia, where they could expect savage punishment, or to seek asylum. Unsurprisingly, they chose the latter, and their hearing is in August. The Draconian regulations that apply to visa seekers in the UK forbid them from working meantime. Rather than have the family sent to a detention centre, they have sold all their valuables, and survive on the goodwill of well-wishers. That evening, I successfully rejected the idea of the validity of Islam as the true path in my life, when Amri, my husband, showed me a YouTube video on how the Jews perform their prayers. It was a shocking moment. I got it… Islam is a religion resembles other religions as simple as this! So there is nothing supernatural about it. That day was a revolutionary day, I abandoned the Quran, I completely stopped praying. Let me tell you about the old me.. The devout Haifa. I was brought up in a conservative environment. My family was considered moderate, they were not very religious in their day, as they were used to have a satellite TV at home, which meant I had access to a variety of international channels. I spent my childhood as normal amongst my family, and life carried on as usual. the two Saudi official channels that promote Wahhabi tenets. Therefore, I began to change, I became very strict, and with the help of my new friends at school, there was a transformation in my personality, I believed it was an enlightenment. As a result of this horror, I became to be known with my strict beliefs which were praised and encouraged to have, as they were considered a high level of faith. And they are still promoted. My brothers insisted to install the satellite TV after a while nd indeed they managed to do so, however my strict religious behaviors developed. I did not want a satellite TV at home, so I started to spend my time in a solitary, praying, memorizing the Quran, reading the hadith and studying for my school. as this is the perfect method to fast according to the Hadith. At high school, I was popular in preparing Islamic seminars preaching Wahhabism and advising the rebellious girls to repent. So when it comes to Jihad, I truly talked to myself that I would go for Jihad sometime, because the martydom for the faith is one of the fastest ways to enter the paradise. It felt so real, it really did. Wahhabism is there … in the air!!! But the truth is I did not know!! My critical thinking was not enhanced or in another word was deliberately ’deactivated’. My mindset was totally controlled to blindly accept what was given without questioning. In my society I lived within, it was 100% of the people who believed the way we lived was the true way of life. It was very impossible not to join. There was no space or time to think for myself. To think of the validity or morality of many things in my belief. No room to critically think about the contradictions I had been experiencing, which were obvious to see but just I needed to open my eyes and before that I desperately needed to open up my mind’s doors. At the time, my consciousness was unconscious. you feel that fear from the hell takes you to the certainty of its existence. My life was guided by fear, and inspired by ignorance, and this strategy still works with many others. So how come I ended up to be a big fan of Bertrand Russell whose principles and views contribute to build up a new understanding of life on the basis of evidence, science and knowledge? despite the fact I did prefer a Mattawa, a very strict person like I was. Amri is a different person, he is a rebellious son, he did not pray at the mosque, or show his religious attitudes to his people. He was considered shocking in his day on account of his advanced views in religion and politics. Amri spent almost his childhood amongst the doves and pigeons, he loved them. He started with one dove, and ended up with more than 100.
and its close association with the authority. While I was practicing my religious beliefs, Amri , on the other hand, rejected them. He refused to accept the ideology which prevailed amongst his people. A society that was forced to blindly accept a body of ideas which were unquestionable, and questioning was taboo. in order to allow his siblings to learn more and eventually brought the internet to help them expand their mindsets. He used to have debates with his father about the relationship between the religious authority and the government on the way they control people and manipulate them. Amri was dreaming to study politics. However, at the university he was told ‘these studies were not for ordinary people, if he had someone to pull strings in order to get into the school of politics, he should ask them to help’. Amri chose mathematics instead, his great pleasure, it is the language of truth as he always says. His attitudes, however, were unacceptable and inappropriate in politics, religion and his lifestyle too. So in order to tackle these issues, he needed to change. He needed a religious woman to convert the “infidel”. The marriage was an attempt to convert the rebellious son. I could not dictate what it was inculcated in my mind to him. We had countless discussions and debates at home about some Islamic stories and historical events, analyzing their rightness, morality, and intrinsic values as some are difficult to believe. And others are unethical to accept to believe in. I began to change because I started to critically think. Truly, I started to enjoy the discussions, I was heard, and able to voice my opinions. I was able to speak out that rational voice inside my head that encourages me to question and analyze the reality I had been living. With Amri, there was a different world, a world (which was our home in Saudi Arabia) where we could discuss anything, anytime no boundary lines. It was indeed what was meant by the freedom of expression. and that moment in that evening was the point when I said enough is enough. Enough of favouring the comfortable myths over the facts. Amri was an excellent and passionate mathematician teaching high school students. We together produced handbooks in order to facilitate the maths curriculum and to make it enjoyable too. The students loved and enjoyed them and started to change their attitudes towards math. Our goal from that was to make the students think differently about the philosophy and the facts behind the numbers and equations, as we do with our own children. Amri also worked hard in order to develop a new educational system at school. It was a challenge but he really enjoyed it. Unfortunately, he was forced to transfer from school to another, because he failed to show his Islamic beliefs in public. Persecuted even by the educated society, but he carried on his career as he loved. Amri’s ambition did not stop at teaching, he wanted to fulfil more, so he applied at the educational ministry in order to get a scholarship to complete his postgraduate overseas. He was interviewed and successfully passed, waiting for the application to proceed. the promises and the positive changes the Arab Spring might bring to Saudi Arabia. What a harrowing experience!! After years of contributions and hard work, he was fired. We did not know what to do. Amri’s dream was crushed. I knew how important it was to him, I could do nothing but support. We were devastated but we must find a way. I needed a push. Amri was the only one who changed my attitudes towards my own life, so I would do the impossible to support. At the time, It was very difficult to find an offer at a medical university, so I applied for a culinary art management at the University of West London, imagining that once I finished my studies I would be able to open an organic restaurant somewhere. I set a plan to manage to get English qualifications, but Amri asked me to be in 10 weeks. It was an imperative necessity to do so, there was no option but this, so I must do it for my family. I studied at home practicing reading, listening, writing and speaking all at home. We could not apply for the visa within our country, fearing that if the authority found out what we had been planning, they would prevent us or they might arrest Amri. So we escaped to Egypt!! Amri somehow knew about Egypt as he went there during the Arab Spring. We could enter it without a visa. and were supposed to stay there until we would be able to travel to the UK according to the visa entry date. Out of the blue, the Egyptian military staged a coup over the elected president. We witnessed people protesting in the streets and a state of emergency was declared. It was definitely unsafe for us to stay there, so we fled Egypt to Morocco. There, we spent one month and then travelled to the UK at last in August 2013. When we arrived in the UK we had savings in our bank accounts, but no income, so we needed a sustainable income. Therefore, I applied at the Saudi embassy to get a scholarship as all self-funded students do once they arrive in the UK, but I was rejected. I was refused to get the scholarship unless I could meet conditions and terms which were not applied on my classmates at the university at the time, and indeed I successfully met them and because my position in the UK was much stronger than to be in Saudi Arabia, I successfully secured a government-sponsored scholarship after a while. I was confused, shocked and angry, an academic year to be lost just like that. All because the educational department at the embassy did not investigate, that the course was not complied to the current system, According to the paragraph seven in its regulations and terms, and therefore they asked me to fail in the exam in order to retake another course within another university in accordance with the system. At the time, my dream to study medicine became a nightmare. What on earth was I going to do?!!! It was impossible to find another medical university in the UK within a short period of time. So I was instructed to apply at the University of Glasgow for a pre-medical course. And as the Saudi government has a mutual agreement with the university of Glasgow for a medical degree, I successfully obtained an unconditional offer in the course based on an interview and a higher English qualification. The embassy proceeded my application at the University of Glasgow afterwards. Meanwhile, we had very hard times dealing with the Saudi government. Amri was electronically elected via elections held online to be the chair of Saudi Students Club in Preston. Amri’s duty was to assist Saudi students in their academic issues. He was instructed to continue efforts started by his Saudi predecessor of converting a local church into a Wahhabi mosque, ‘they wanted Amri to complete the purchase’ He was also asked to stand up every Friday prayer to call for donations from the local Muslims in order to support activities held in the mosque. Amri felt uncomfortable and therefore he informed the government about these suspicious behaviors. Surprisingly they responded to Amri, just to follow the current system. Amri realized that he had to end his duty, as this was not what he was supposed to do, to be used and manipulated in order to achieve interior motives. Within one month, he resigned and his resignation was officially accepted. After the resignation, money began to appear in his British bank account, without his consent or prior knowledge. The money was transferred by the Saudi embassy in London. Amri is concerned about the money-laundering issues associated with terrorism, as the money might be used to train or equip jihadists in the UK. With the use of Wahhabi ideology, this money might be used to help drive terrorism. Amri indeed made a stand. He did not submit to their orders to do what they wanted. Instead he requested an official statement from the embassy to clarify why the money was deposited into his bank account. Amri was trying to safeguard himself not to breach the law in the UK. Therefore, the government started to abuse us as a family by using their totalitarian methods. They gradually began to oppress us, step by step. Then, they suspended the monthly allowance my children and myself should receive according to the scholarship agreement, and Amri was told the embassy would take their money back by deducting it from my scholarship. Besides, he received phone messages that if he did not listen to them, my scholarship would be affected as a result. Two Saudi nationals were sent to our home’s doorstep in Preston, shouting threats that they would take revenge. My children witnessed this incident, they felt insecure, haunted, that those two people might come anytime to attack us. They were haunted by every single sound they heard at night. And there was no way to calm them down but to sleep with them in their room. Could you imagine that feeling of horror every night you go to bed; you don’t know whether you wake up in the morning or not, feeling unsafe..uncertain? After a while, he was invited to travel to London to discuss this matter at the embassy, and Saudi officials threatened and blackmailed him that they would prosecute him back home. Amri had been asking for an official statement, what are they really concerned about he is wondering?! Is issuing this letter a real issue for them? Finally, after these attempts failed to discipline him,the Saudi authority refused to pay the tuition fees to the university of Glasgow despite the fact that they had confirmed the scholarship prior to the commencement of the course. They had even provided me with an official letter to confirm the scholarship to the Home Office in order to obtain the visas. They cancelled the scholarship because it is the only and the shortest way to get Amri back to Saudi Arabia to punish him. So this is it. This is our experience as Saudi citizens under the repressive system. Manipulation..Abuse and with the use of scare tactics they impose what they want on their citizens. For disrespectful blogging and criticism of the religious authorities, one thousand lashes, to be administered 50 at a time. A fine of one million Riyals (roughly £170,000). 10 years in jail. If, like me, you have been wondering what horrible crimes could merit so severe a punishment, now you can find out. I across a selection of Raif Badawi’s writings in my local Waterstone’s, and see that it has been published in the US, UK, and Canada, and that it is also available in French, German, and Italian. I do not know if there is an Arabic version; if there is, it will certainly not be available in the author’s native Saudi Arabia. However, the attempts to silence Badawi have ensured him a far wider audience than he could ever have thought possible. Having read the offending blog posts, I am shocked. Not because they are strident, or violent, or opposed to religion, or subversive of government, but because they are none of these things, and yet have attracted so extreme a reaction. A brief foreword to the book (see below) is followed by a short preface, by the bilingual TV journalist Constantin Schreiber. This places Badawi’s writings in context, and describes how the hopes he expressed in the days of the Arab Spring have been dashed by events. Unlike Schreiber, I am neither an Arabic speaker nor an expert on events in the Middle East, so I am doing my best here using the English language translation and my own limited background knowledge. If I have been guilty of any mistakes or misinterpretations, I hope that better-informed readers will point these out. Many of the Islamist activists of Saudi Arabia dream of the return of an era along gone: they fantasize about the times of the caliphs. Those caliphs were known to banish and murder their opponents.… The modern Islamists hope history will repeat itself. Indeed, we now once again have a self-styled caliph, at the head of the entity known as Daesh,  that now of all times needs no further discussion by me. I call upon NASA to abandon its telescopes and take advantage of our sharia astronomers. I call upon NASA to abandon its telescopes and take advantage of our sharia astronomers. It seems to me their sight is sharper than those broken telescopes at NASA. I believe NASA should send some of its scientists to our preachers to study real science.… medicine, engineering, chemistry, and geology… Physics and nuclear science… Oceanography, pharmacy, biology, and anthropology. I have produced similar catalogues of the sciences myself when spelling out the claims of self-styled Creation Science. But full-blooded Creation Science is a fringe belief, even among theologically Conservative Christians, while the sharia scholars to whom Badawi refers are at the centre of the Saudi power structure. This in the heartland of the culture that once gave us astronomers like al Biruni, whose historical data are still of value today, and al Tusi, whose geometric constructions reappear in Copernicus. this chauvinist Islamic arrogance they display; they disregard the innocent blood spilled because of the plans and barbaric and brutal masterminds under the slogan of “Allahu Akabar.” They see this innocent blood as nothing compared with building a mosque that will undoubtedly hatch new terrorists.… We in Saudi Arabia refuse to build churches altogether. What do you think we would do if those who wanted to build such houses of worship were the same people who stormed our lands? How will we be able to build a human civilization with positive relations with the 7 billion people around the world when 5.5 billion of them don’t even believe in Islam? We need those who believe in planting hope in our souls. Such a state would only seek to spread a culture of ignorance and death within its people. Instead, we need those who call for life and civilisation. We need those who believe in planting hope in our souls. Incapable of creative thought, incapable of building culture. They are unable to create their own modern structure or even practice systems of civilization bestowed upon them by others. Any religion-based state has a mission to limit the minds of its people, to fight the developments of history and logic, and to dumb down its citizens. European countries developed into nations buzzing with civilization, active in building the rights of the individual and exporting knowledge and science for the rest of humanity. These communities welcome to the culture of enlightenment, life, and creativity as they led a revolution against ignorance in all its aspects. Conversely, the religious philosophy controlling our lives in Saudi Arabia is fighting a daily war to plant and impose the lines of Salafi religious ruling, which was forced upon us hundreds of years ago. Very clever. He is not attacking Islam, but only one of the many traditions within Islam, and even then it is not the doctrine itself that he is opposing, but the way it is being imposed. And he is reminding us that Salafism is at once too old to correspond to modern reality, and too young to lay claim to ancient authority. There are no doubt many other such refinements as this throughout the book that would be understood by his intended audience. Next we have an essay, written in February 2011, in celebration of the Arab Spring and its seeming victory in Egypt. Where, since then, we have had in rapid succession an election victory by the Muslim Brotherhood, a military takeover, and the emergence of a government that manages to combine the worst features of both religious and secular regimes. It’s a wonder of human behaviour: we build our own handcuffs that trap and harm us. We create the myth, and we honour it. If we continue to limit women’s lives, some might have to take immoral routes to bring bread to the table. Data are hard to come by, but we know exactly what he means. Many… try to advertise liberalism as a line of thinking that rejects religion, somehow suggesting liberalism is a religion of its own. This cannot be further from the truth.… Every intellectual has the right to promote and discuss his own philosophy. This gives people the right to pick what they like from these views and methods. Most of the attendees insisted liberalism, first and foremost, is an enemy of all religions, especially Islam, and considers it to be a religion of its own. I am reminded of the claims I hear every day here in Scotland that secularism is a religion, that a challenge to religious privilege is a threat to religious freedom, that religion is essential to national identity, and that the representatives of religion have the right, if not indeed the duty, to speak for society as a whole. If the values Badawi is espousing are universal, so is the reaction against them. It would, however, be impudent to compare our situations. I may be moved to complain that Church representatives sit unelected on Scotland’s Education Committees, but no one is going to fine, imprisonment, or torture me for questioning their right to do so. A liberal country has no religion, which doesn’t mean it’s godless. It means it protects the rights of all the religions and nurtures all of them without distinction or upholding one over the others. Liberalism… goes in harmony with religion: both always call for good, love, and peace. The obsession with finding a ready-made example is similar to the need of a teenage boy for a father figure to give guidance. It is a clear sign this nation is still lacking in development and weak in its base. [The current] Western example is based on the value of superiority and power. It relies completely on the servitude of poor nations to their external loans. It is based on the colonising division and the support of some groups and some military forces in the regions of the East and South. This Western example is heavy with delusions of total control over the keys to wealth and the secrets of power. It is threatening the values that created the magic of the West over many decades: the values of intelligence, equality, world peace, protection of the environment, conviviality, and the many other values that will lead to the immortality of humanity. One could argue about whether the French Revolution merits such unqualified applause, whether the West was ever as true to its stated values as Badawi suggests, whether “constant improvement is a natural movement for humanity” (but for powerful quantitative evidence in support of this view, see Stephen Pinker’s Better Angels of our Nature), and from our comfortable armchairs we could even take exception to Badawi’s failure to mention the rights of those without any religion. All this is to miss the point. If there really is to be any hope of an Arab Spring worthy of the name, Badawi embodies it. Badawi is far from unique. Many others are punished for speaking their minds in Saudi Arabia, or even, like Badawi’s own lawyer Waleed Abu al-Khair, for coming to the legal defence of others who do. Indeed, in some ways Badawi is fortunate. Unlike Abu al-Khair, he has not come before Saudi Arabia’s Specialised Criminal Court, which handles dissent alongside terrorism. His wife and children are safe in Canada, he has for health reasons so far received only fifty of the thousand lashes to which he has been sentenced, and his original conviction for apostasy was modified to spare the Saudi authorities the embarrassment of executing so public figure. Not that these authorities are averse to executions; they have carried out over 150 so far this year. His name is widely known and his voice is heard. And in the Internet age, borders are porous. Saudi Arabia is a major customer for the UK’s armaments manufacturer, BAE systems, so much so that in 2008, the Blair government persuaded Britain’s Serious Fraud Office to drop bribery investigations regarding this trade, for the sake of national security. The weapons supplied are presumably among those currently being used by the Saudis in their bombing campaign in Yemen. Salafism, a form of Quranic Fundamentalism, is currently the fastest-growing branch of Islam, largely as a result of Saudi generosity; it also provides the rationale for the pan-Islamism of Dash. Relations between the UK and Saudi Arabia were extremely close during the lifetime of King Abdullah, but have come under strain recently when the UK pulled out of a contract to train Saudi prison officials. We are assured, however, that Cameron is taking action to heal the rift, as a matter of urgency. 1] For why I use this term, and wish the BBC and other media would do likewise, see here. 2] Some historians might wonder if this is entirely fair. But if it is not, it is precisely because the priesthood never had a total grip on political power, but was challenged internally by the secular authorities, and, latterly, externally by exposure to Greek learning, diffusing back from the Islamic world where it was then valued. Image of King Abdullah bin Abdulaziz International Centre for Interreligious and Intercultural Dialogue building from Wikipedia entry. Image of Prime Minister David Cameron receiving the King Abdullah Decoration from the King himself during a November 2012 trade mission, from Daily Mail on line. This article first appeared on 3 Quarks Daily. A second round of lashings was postponed for medical reasons. Not so good. Another 50 lashes were due to be administered today, 16 January, after Friday prayers. And 18 more Fridays to look forward to, at the start of a 10 year prison sentence. His crime? Creating the “Saudi Arabian Liberals” website and “insulting Islam”. The King’s office is reported to have referred the case to the Saudi Supreme Court. Sign the Amnesty petition calling for his release here. King Abdullah inb Abdulaziz el Saudi, US Government photo. 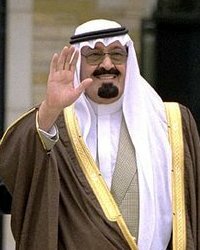 The King himself would like to be considered, and may well consider himself, a reasonable and enlighted ruler, and has established the King Abdullah ibn Abdulaziz Centre for Interreligious and Intercultural Dialogue, Vienna. Raif Badawi is an Amnesty Prisoner of Conscience, who has been found guilty of “disrespect” and “disobedience;” I have discussed his case here and here. Raif Badawi was sentenced to 10 years in jail and 1,000 lashes after starting a website for social and political debate in Saudi Arabia. He was charged with creating the ‘Saudi Arabian Liberals’ website and insulting Islam. His sentence also included 1,000 lashes, a 10-year travel ban, a million-Riyal fine and a ban on appearing on media outlets. Badawi has been awarded the One Humanity Award 2014 From PEN Canada, the Netizen Prize of Reporters without Borders 2014, and the inaugural Thomas Aikenhead Award of the Scottish Secular Society (after checking with his wife, who lives as a political refugee in Canada, that this would not be unwise). The charges against him relate to articles Raif wrote criticising religious authorities in Saudi Arabia, as well as pieces written by others which were published on his website. Amnesty reports: Someone present at Raif Badawi’s public flogging on 9 January described this account of Raif’s flogging for us. The witness has not been identified for security reasons. ‘When the worshippers saw the police van outside the mosque, they knew someone would be flogged today. Still shackled, Raif stood up in the middle of the crowd. He was dressed in a pair of trousers and a shirt. Another 50 lashes to be administered today, 16 January, after Friday prayers. And 18 more Fridays to look forward to, at the start of a 10 year prison sentence. His crime? Creating the “Saudi Arabian Liberals” website and “insulting Islam”. Sign the Amnesty petition calling for his release here. This is an update to my earlier post concerning the Saudi blogger and Human Rights activist, Raif Badawi, who stands convicted of “setting up a website that undermines general security”, “ridiculing Islamic religious figures”, and “going beyond the realm of obedience”. His sentence is to 1,000 lashes, 10 years in prison, a fine of 1 million riyal (currently £180,000), and a ten year ban on public activity after release. The lashings, according to unconfirmed reports, will be administered at a rate of 50 per week, starting on Friday January 9, in front of Aljefali Mosque in Jeddah, after prayers. Saudi Arabia is currently a member of the United Nations Human Rights Council, and has set up the International Centre for Interreligious and Intercultural Dialogue in Vienna. Comment is superfluous. Raif Badawi’s wife, Ensaf Haidar, has accepted the Scottish Secular Society’s first annual Aikenhead award on his behalf. Haidar, herself an activist and human rights defender, fled first to Lebanon before seeking asylum in Canada which she now lives with their three children, two girls and a son. “Ladies and Gentlemen, my husband Raif Badawi was imprisoned just because he expressed liberal opinions. This is a crime in Saudi Arabia, punishable with ten years imprisonment and 1000 barbaric lashes of a whip. What my husband Raif was subjected to is an inquisition, done in the name of the Saudi interpretation of religion. Shamefully one should add, Saudi Arabia is spending hundreds of millions on the King Abdullah bin Abdulaziz International Centre for Interreligious and Intercultural Dialogue, (KAICIID) in Austria – a public relations project to polish its image, which fails to hide the Kingdom’s persistent violations of human rights. While promoting its so called ‘dialogue, openness and tolerance’ with the outside world, the Kingdom has been systematically silencing any expression or opinions or peaceful activism and sending those who dare to speak out behind bars. My husband is one of them. This glaring discrepancy has led the Austrian Green Party to demand its closure in Vienna, asking that the Kingdom begins by promoting these values first in its own land. My husband has been awarded several prizes, including the Humanitarian Award of the Canadian Organization PEN and the Netizen Prize from Reporters Without Borders, and now you, the Scottish Secular Society, have awarded Raif the AIKENHEAD AWARD, 2015. I am both honoured and grateful for this distinction. These awards send a clear message round the globe about the Saudi regime. The continuation of Raif’s imprisonment is shameful, especially as the Kingdom claims to be part of the international coalition against the Islamic State (IS). Saudi Arabia is no different from the Islamic State when both lash and kill in the name of religion. In the name of my husband Raif Badawi, I would like to express my sincere appreciation and gratitude to the Scottish Secular Society and to your Vice Chair, dear Ramin Forghani, for his continuous support. Petition now closed for timing reasons. I will share more information about the case as available. Join Amnesty’s letter writing campaign (form letter provided; individual even better) to King Abdulaziz regarding Raif Badawi. Write, publicise, tweet. Badawi was sentenced to 10 years in jail and 1,000 lashes after starting a website for social and political debate. Reports suggest that administration of the punishment will begin this Friday, 9 January (after prayers) and continue at a rate of 50 lashings per Friday, for a further 19 Fridays if he survives so long, which is doubtful. Some reports (we are checking on the accuracy of these) say he is diabetic, which would make wound treatment more difficult, and it is unclear what quality medical attention he will be receiving. King Abdullah ibn Abdulaziz would wish to be known as a wise and just ruler. He is widely credited for the 2002 Arab-Israeli peace initiative, and has carried out various internal reforms, including the creation of what is now known as the King Abdulaziz Center for National Dialogue. The terms of this dialogue, however, are strictly limited. The use of social media in Saudi Arabia is closely monitored, with harassment and severe punishments for those who criticise the authorities, while last October Saudi Arabia’s top Muslim cleric last week described Twitter as “the source of all evil and devastation”. International protest at Badawi’s treatment will at worst show that such barbarism carries a cost, with implications for future decisions, and at best may strengthen the hands of those, even within the Saudi government itself, who might wish for reconsideration. Indeed, Amnesty campaigns on behalf of prisoners of conscience have in the past, on occasion, been surprisingly successful. A consortium of intellectuals with relevant connections has also been writing to influential Saudi princes (government in Saudi Arabia is verymuch a family affair) on Badawi’s behalf. Raif Badawi, image from his Twitter page. I would welcome further information. According to Wikipedia (see also here, here, here, and here for reports from the press, the BBC, Human Rights Watch and CNN respectively) Badawi was first detained on apostasy charges in 2008, but was released after a day of questioning (in Saudi Arabia, apostasy carries an automatic death sentence). The charges were revived, but not acted on, in 2012, the year in which he was arrested for allowing material criticising the authorities to appear on his website.In 2013, he was sentenced to seven years in prison and 600 lashes for founding an Internet forum that “violates Islamic values and propagates liberal thought”, and this was increased in May 2014 to 10 years imprisonment and 1,000 lashes. Badawi’s lawyer Waleed Abulkhair has himself been jailed after setting up Monitor of Human Rights in Saudi Arabia, a human rights organization. Saudi Arabia is currently a member of the United Nations Human Rights Council. Scottish Secular Society Aikenhead award, named after Thomas Aikenhead who at the urging of the Church of Scotland was hanged for blasphemy in Edinburgh on 8 January 1697. The design represents human fingers penetrating granite. Saudi Arabia is a major customer for the US and UK arms industries, and it was the Saudi army that, at the invitation of the Emir of Bahrain, entered Bahrain to suppress the popular uprising of 2011. *Currently managed by his wife.